Recently billionaires Bill and Melinda Gates and Warren Buffett made a public plea for the wealthy to use their resources to improve society during their lifetime by donating to philanthropic causes. I applaud their goals but not the method. There's a better way for those with resources to help others and I learned it from the wise teacher Milton Friedman. 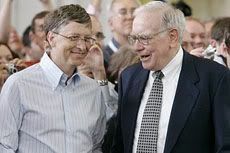 On The Giving Pledge website Mr/Mrs Gates and Mr. Buffett "invite the wealthiest individuals and families in America to commit to giving the majority of their wealth to philanthropy." In the FAQ (frequently asked questions) they say that they are focused on billionaires and are requesting a public pledge. The public nature is designed to encourage others to emulate their actions and inspire discussion. Read the FAQ here. I agree with Gates and Buffett that money should be put to use now rather than stored in a vault for future generations. I'm on the board of the local Boys and Girls club and I'm constantly pressuring them to use funds in their foundation to help young people today rather than stockpile money for the future. I also think it's an admirable goal to ask how you can improve the world with the resources at your disposal. The backers of the The Giving Pledge want a "lasting impact" and advocate giving the majority of your wealth to charities to achieve it. Charities may have good intentions, but they are no better than government bureaucrats at deciding what is best for other people. Those not directly involved will not make as informed decisions and beneficial decisions as those who are. Mr. Gates would not have a charity design the next version of Microsoft Office. Mr. Buffett would surely object to a non-profit deciding the next investment for Berkshire Hathaway. Yet by advocating charitable efforts they are inherently advocating the process where one group makes decisions about what another group of people need. Most times charities will be wrong and unlike a business, there is no feedback loop. If a business makes a poor quality or undesirable product they will be forced to change to adapt to people's needs or go away. Charities face no such guidance. As Milton says, "They're spending someone else's money on someone else." Some might say, "What can it hurt to have charities distribute money?". History indicates it can have a hugely detrimental effect. One can examine the great charitable experiment called Africa to see how a half a trillion of well meaning donations prop up cruel governments, cripple economic freedoms, and retard meaningful change over the last 50 years. By any measure the monies have achieved the exact opposite effect. Africa has seen its GDP decline during the last 50 years along with a decline in life expectancy. When I took MP3.com public I was a large shareholder and nearly overnight I went from a childhood where I knew poverty to not having to worry about money. At the time I pondered how I could use resources I now had to improve the world like those behind The Giving Pledge. To answer that question I called Nobel prize winning economist Milton Friedman. He invited me to San Francisco where I sat down with him and his equally sharp wife Rose in their condo. Over a glass of water I asked Mr. Friedman how I could improve the world. He told me that giving to charity has a certain psychological benefit to the giver, but economic growth is the path to improve peoples lives. To spur that on you inject more capital into the free market system. He wasn't opposed to charitable giving, he called it honorable, but he cautioned that it wasn't an efficient path to improve people's lives. A few days later after my visit I received a handwritten note from Mr. Friedman and some photo-copied passages from one of his books. Watch video of Friedman on how the poor escape poverty and on our responsibility to the poor. Mr. Friedman was right. To ultimately improve someone's live requires economic growth. To achieve this requires a free market built upon a rule of law, property rights and the voluntary exchange of goods and services. Once those components are in place then providing capital (money) to spur the formation of businesses is the accelerant. Those with wealth should provide capital to start new businesses or take steps to make free market accessible to more people. There's no way to change the DNA lottery, but living in a market system is sadly still a rarity on this planet. Two-thirds of countries in the UN are undemocratic (communists, dictatorships, etc). The best way to improve people's lives is to give more people the opportunity to flourish in a free market. The Giving Pledge calls for the wealthy to give 50% or more of their net worth to philanthropic causes to make the world better. Instead they should put that wealth to work giving others the same opportunity they have so successfully exploited to participate in a free enterprise system. This would create the lasting impact The Giving Pledge desires. To discuss this topic with others, click here! Do YOU generally agree or disagree with Michael in this week's Minute shown above?